(Sam) Chris was on the road at 7:31. After about 15 last minute returns to our non-cyclopian room, Dave and myself (Fotus Mumulitus) met Chris and the Body at the base of the 999 steps which led up to the 15th century Venecian citadel. I thought we would be able to run the entire way but we did have to stop a few times. In fact we all felt a little quezze. At the top, we bought our tickets and entered the formidable Venecian walls. Chris looked a little pekid and assumed a supine position. I told him not to fight the feeling, to learn to love it, savor it. OK, we are stationary now. (handwriting improves) Anyway, Chris felt much better after he tossed his cookies. (Greg) After exploring the battlements for a few hours and admiring the terrific view of the Mediterranean and the city, we climbed back down the 998 stairs to our room below. About noon, we piled into our "ride" and left town following signs toward Mikinos. Cyclopean Walls, so named because Greeks of the Socratian age found these relics of days past so HUGE that only a giant could build them, and so UGLY, only a one-eyed giant could want to live there. 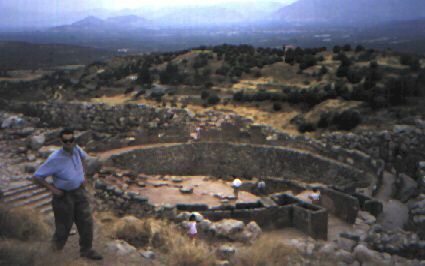 These walls dominate these ruins, the home of Clytemnestra, wiley wench woman wife of Agamemmnon who cooked her kids in Aeschlyan tragedy. The ruins are perched on a hill so she could see the sea-borne approach of her perspective victim. Tough love as the Trojan War ended. We had a SuperMarketLunch in the parking lot before entering. We saw the cistern deep within, flashlights blazing and 2 DC tourists tagging along. There were echoes, moist walls, and pipes - Greeks used it for water, but the water evidently needed steps to get up. There were many nice things - rocks, tholos (tombs) which were round with double walls and ancient Sprite cans. 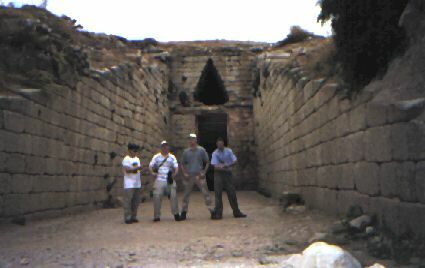 The big, domed tholos belonged to Clytemnestra and another relative, Aegisthus. There were great acoustics (echoes) within. Chris (me) twisted his ankle but it healed immediately. On the way to Nafplion, we saw a turtle, but it got away from our group. 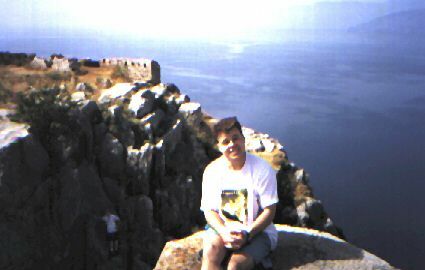 At Nafplion, all but Dave swam at the rocky beach of the Mediterranean. Greg cut his foot but peroxide Dave healed it. NOTE: Sam has a problem: he always needs to floss and keeps losing his piece he sets aside. Then, he rips a thread from his shirt and uses that. He will be a dentist. NOTE: Dave does not keep a log of his logging experiences, but the rest are averaging 1 1/2 - 2 days per dump. (Sam) Up to that point (the one above that is), my favorite experience was flossing. Swimming in the Mediterranean was Great. The beach was rocky but floating in the cool waves was very relaxing. After a stop in the Hobit hole, we decided to eat at one of the great variety of out-door restaurants which all had the exact same menu. If your restaurant was out of a particular item on the menu, the waiter would just order it next door. We (all four of us, that is) had Kaibobs. We ignored the waiter's advice and ordered three cheese salads also. We knew what we wanted. All that we wanted was a cheese salad, ooh yeh! (sung to Ace of Base song) And we got it. It turns out that a "cheese salid" is about a cup of feta cheese in a saucer one consumes with bread. With my powerful gastric skills, I finished my entire serving. Dave spread his around on the plate to make it look like he ate more. We paid for our meal on the commie card because this way we are not really paying. After a short stop in the dug-out, Dave, Chris, and myself went to say our rosarie by the ocean. Greg Bodoh could not come because of his cut foot. While we were praying, billions of little silver fish swam back and forth along the peer. A Greek Machismo stopped and asked us in Greek if we were fishing. We said that we were not but would love to give it a try if he had some poles. Back at the homestead, we went to sleep early because tomorrow would be another big day.